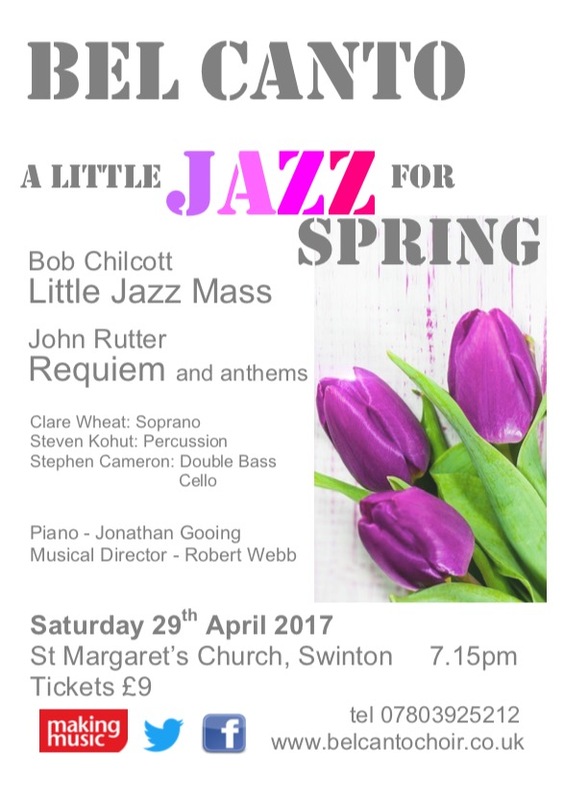 Spring is in the air and Bel Canto are stepping into the world of jazz with Bob Chilcott’s very popular ‘Little Jazz Mass’ along with a collection of everyone’s favourite anthems from John Rutter and completing the evening with his well loved Requiem featuring the calming ‘The Lord is my shepherd’ and beautiful soprano solo, Pie Jesu, performed by Clare Wheat. We welcome back the talented and versatile percussionist, Steve Kohut who has performed with Bel Canto in recent months. We are also looking forward to welcoming cellist/double bass player Stephen Cameron back to his hometown of Swinton for the first time in many years. With Jonathan Gooing on piano and Robert Webb at the helm, it promises to be a superb evening.